For some of you this blog post may be a blast from the past - its over 6 years since I first blogged about celery (or to give it the full title: Why its better not to let a farrier or trimmer near your horse with anything sharper than a stick of celery). Back then I also posted about the numbers of horses whose soundness was impaired by trimming and who were measurably sounder when allowed to manage their own hooves instead. I hoped I wouldn't need to write more celery posts and its been good to see more and more people experimenting with allowing their horses to self-maintain, something which becomes even more important if you have a horse who is recovering from injury and who may need asymmetric hooves to provide essential support. 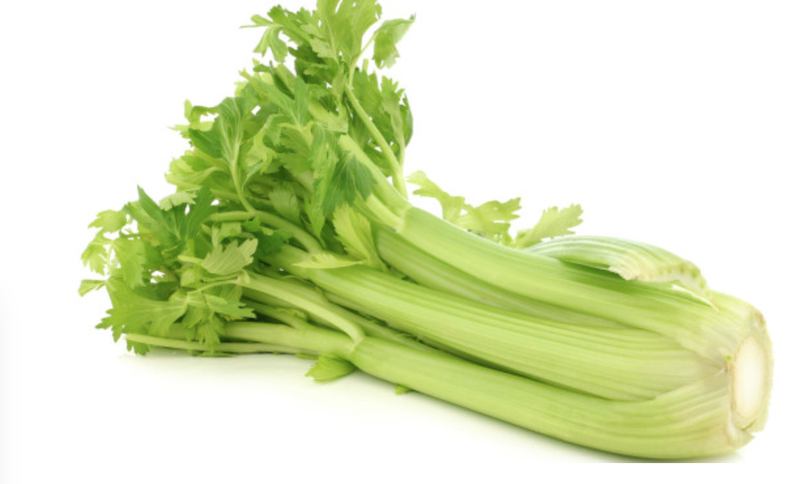 However, it seems to be time for a new celery post because poor trimming has become an increasingly common problem once more. I have been told of several horses who have been lamed by poor trims - some by "qualified" farriers, some by "qualified" trimmers - and I am also seeing more reports online of horses being footy after trims. There also seem to be lots of "methods" of trimming being taught over the internet, usually using only photos and ignoring how the horse is moving. These tend to feature an aggressive approach which requires hooves to be trimmed to a template and removing all "flare", something which will render many horses unsound. The reason for this post is very simple: to ask owners to stand up for their horses and never to be bullied into having your horse trimmed if it is to the detriment of his soundness. There are lots of "hoof experts" out there but the only one worth listening to is your horse. If the horse is moving better, more capably, more confidently, with a better stride length, over tougher surfaces after a trim, then it was the right thing to do. If the horse is moving better, more confidently, with a better stride length, over tougher surfaces when he is left well alone, then stick to celery. There is NO reason to trim unless to make the horse sounder, and if the best way to make the horse sounder is NOT to trim, well then, embrace your celery." New horse Jet arrived at the weekend. He is an ex-racehorse who has successfully competed in endurance and eventing more recently and went lame with a diagnosis of navicular bone oedema on MRI. He has the relatively weak digital cushion and under-run heels that are not only typical with this diagnosis but which are also common in ex-racers; its no surprise therefore that he is landing flat on this foot though he has a marginal heel first landing on his right foot. He has worn shoes up until 4 weeks ago, when he was put onto box rest; happily he has a fairly relaxed outlook on life and, like most horses coming off box rest, has taken well to a more active life on our tracks. 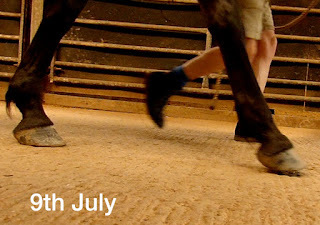 Its yet another useful feature of tracks that they encourage regular, gentle exercise rather than the sort of high intensity, hand-brake turn, stop-and-start galloping that can occur when horses are first turned out after restricted movement. Jet is landing better on this foot even though its the foot he has historically been lamer on. One possible explanation which I see fairly frequently is that the "better" foot has been overloaded to the point that it then becomes lame, even if it wasn't the worse foot to begin with. You can see that he has a better frog on this foot as a result. Shannon arrived a couple of weeks ago aged 22. She had been shod for, presumably, most of her life and has had remedial farriery as well in recent years. It improved her lameness for a while but then stopped working and had left her with weak feet. Shannon was landing toe first and was particularly unlevel on the left front. She was uncomfortable on hard ground initially but has become steadily more competent over the last 10 days. 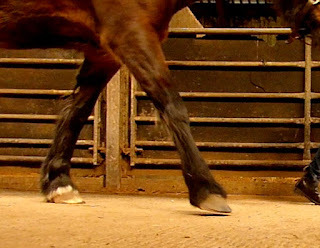 She developed a tentative heel first landing - tentative because although she is landing correctly her palmar hoof is of course still vulnerable and under-developed. Nevertheless that is impressive progress for any horse, let alone one who has been shod of so many years. She was not as lame on this foot but it does have a nasty central sulcus split. These are common and troublesome, prone to infection and can be a barrier to a good landing but fortunately Shannon is tough and is landing well on this foot too, now. A better landing, and liberal doses of Veterinus derma-gel, will be the quickest way to heal this. I am sure that Shannon's next update will show a much more attractive looking foot but, as her footage below demonstrates, she has made a good start. I wanted to update Dallas' photos now that she has been here 2 weeks. She is not yet landing heel first and I wasn't convinced her feet had changed that much; in fact when I actually compared the photos I was surprised. This is her lamer foot which had become club-footed as a result of being unloaded. Despite her poor landing the toe is shortening and the palmar foot is starting to strengthen. Although the frog on this foot is much weaker than the front on the left foot it has still developed considerably. I am hoping a better landing is only a few weeks away. The tracks are an essential tool for feet like this as she could not work safely on hard surfaces yet and needs the stimulus of the conformable surfaces on the track to allow her feet to improve. Her feet are still mismatched but they are I think more symmetrical than they were on day 1. Compare the frog on this foot to her other front foot its clear which for has been working harder. Her frog is now starting to look good on this foot and she should soon be able to land properly. These are stills taken from Rose's footage which is up here: https://vimeo.com/224921839. Like most horses when they arrive here for rehab, Rose was landing toe first and monitoring how feet are loading and landing is a critical part of rehabilitation. I would expect her landing to improve still further over the next few months but she has made really good progress. These stills are from Teddy's footage: https://vimeo.com/224923774. Like Rose he has been here over 12 weeks and there is a clear improvement in how he is landing. You can also see that the effect of a heel first landing is automatically to increase stride length. A toe first landing conversely will always mean a shortened stride. Its always interesting to look back at the initial photos when horses arrive and compare them with how their feet have changed in the 12 weeks of rehab with us. Rose's feet really were quite collapsed behind on day one. You can see the palmar hoof overhanging her heels and how her long toe was giving no support to the limb. Naturally she was landing toe first and she had been diagnosed with DDFT damage. She had previously had surgery to repair it but the tear had recurred which is not surprising given how she was landing. Twelve weeks later and we have a more respectable looking foot which is better able to support the limb and a stronger palmar hoof which is able to land heel first. This has taken the pressure of her DDFT and she is much sounder. Deterioration in the back of the foot is not something which happens overnight and consequently it also takes time to rebuild. 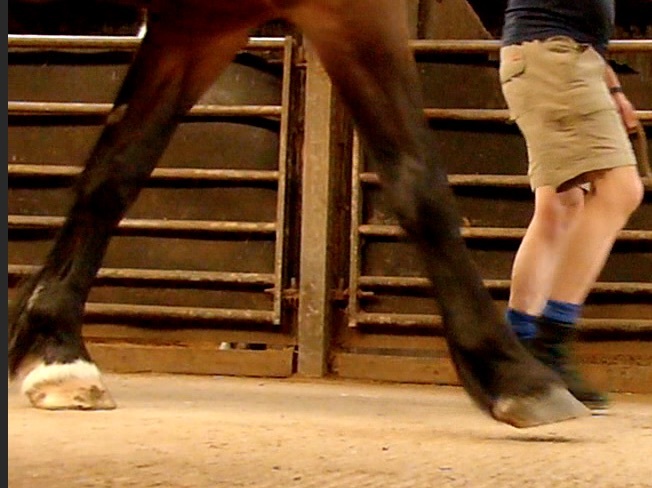 It never ceases to amaze me how fundamentally horses' feet can change - either strengthening or weakening. This is a nice illustration of the fact that hooves do not like to load primarily on hoof wall. Rose has not been trimmed but as her palmar hoof has become stronger the frog, sole and digital cushion have developed and hoof wall has worn away to give her a more balanced and supportive foot. This foot was less extreme but still had similar issues to the right foot. This foot was far less under-run and she was able to start landing heel first on this foot sooner than on the right foot as a result. Apologies for the funky camera angles - I think I was blinded by the sunlight this morning! Teddy has now been here just over 12 weeks so its time for his update. He arrived with his left foot much weaker than his right and he had been diagnosed on MRI with bilateral navicular bursitis and DDFT damage together with further collateral ligament damage to his left foot. When he arrived he was landing toe first and he also had a split in his central sulcus on this foot which was contributing to his poor landing. You can see that his new growth is just over halfway down his hoof capsule and that it is much stronger than the old growth; his weak hoof wall has also improved. The central sulcus split is still evident but it is no longer sore and he has been happy to land heel first for some time now. I use Veterinus derma-gel to treat these sorts of splits, something I discovered earlier this year, and it does a marvellous job. From this angle the depth of the split is clearer to see as it went right up into the hairline originally; it has now almost closed up. This was his better foot to start with but it is now considerably less under-run and again the hoof wall is stronger and denser. The shorter toe and stronger palmar hoof can also be seen from this angle although the changes are not as dramatic as in his left foot. But from the caudal view the change in frog strength is quite clear and you can also see a huge difference in the digital cushion. Unfortunately I can't include video footage as I am short of pairs of hands to lead horses for me but I will add it as soon as I can.